Psychology experts, from David Elkind, Ph.D. to Peter Gray, Ph.D., all agree that the role of children is play. Free, unstructured play especially promotes learning in ways that structured activities cannot. Imagination is unleashed during freeform activities involving pretend play, movement, problem solving, and scenario exploration. So, should parents play with their kids? Should they help with art or school projects? Peter Gray points out that parents can be tempted to take over when playing with their children. Kids need to feel supported, and at times they require guidance, but they also need us to believe in them. This means that our kids should be allowed to direct the play. The parent becomes the one who in fact follows the child’s lead. This means the child’s interests set the pace. According to Gray, some games are better suited to accommodate child-parent play, such as rough and tumble (let the child be your guide), board games or card games, and informal community ball games in the park. It is always important to stay tuned to your child, your idea of fun might not be his. Another mistake parents make sometimes is to commandeer their child’s art or school projects. We all want our child to do well. But what is meant as a show of support can become a general take-over. Many school projects in elementary schools are obviously done by the parents. This sends the wrong message to our children. We are essentially teaching them to be perfectionists and that their efforts are not good enough. It’s also a trust issue, since by taking over the leadership of the project you are telling them that they are not worthy of leading it. Of course, no parent intends to send this message; it’s our overprotective instincts that kick in and get the best of us. Children learn from exploring and doing, and they really learn by making mistakes. It’s okay if the project of an eight year-old looks like, well, the project of an 8 year-old. Children learn from playing with their peers. They recalibrate their behavior when their playmates don’t like their bossiness, they learn to compromise when they have to negotiate the rules of a game, and they master collaboration through the natural teamwork that occurs when playing with their peers. Parents tend to be too hands-on to allow for those lessons to happen naturally. We often see play as another opportunity for learning, instead of letting learning become a coincidental byproduct of their childhood experience. David Elkind is an advocate for more playtime for children. 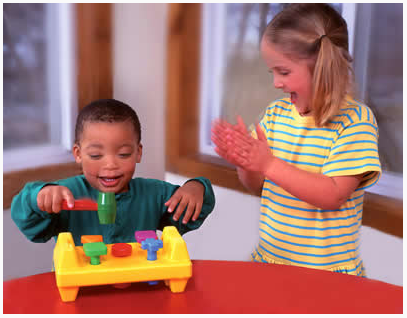 His work has shown that our little ones learn not only social-emotional skills through play but academic skills as well. He believes that over scheduling our kids with after school structured activities is stripping them of development strategies that can only be learned through unstructured play. Adults need to become more playful themselves in order to understand and promote unstructured playtime as a social norm. Elkind reminds us that: “children do as we do, not as we say”.